JESSICA CHAN’S desire to help improve lives is the booster shot that keeps her on top of her multifaceted role as a social worker at Kampong Kapor Family Service Centre (KKFSC). from the FSC’s reading and free tuition programme. In addition to academic needs, the team also works with children in the schools. This involves conducting group work and workshops to impart life skills which give the students an avenue to talk about issues important to them. When a student is found to have family issues affecting his or her studies, Ms Chan and her colleagues reach out to the parents and offer help to the adults. 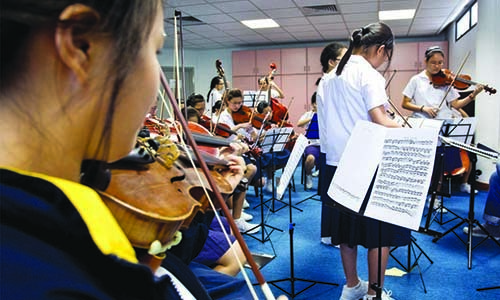 Staff like Ms Chan are often stretched to their limit, yet persevere in service. 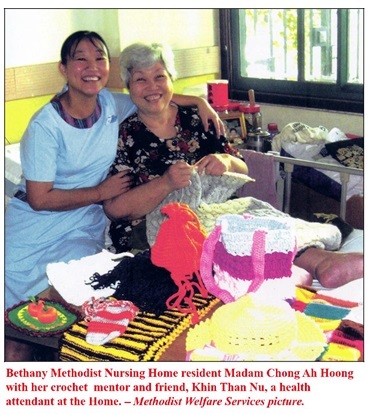 “I am really blessed that I am able to practise what I like and work with a group of people willing to serve in our community,” she said. 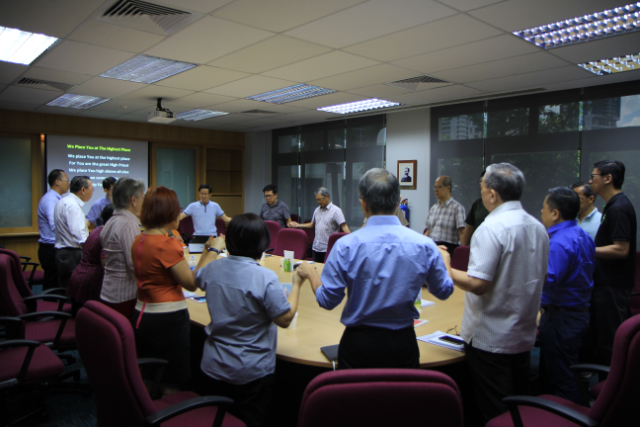 The Methodist Welfare Services (MWS) seeks to offer care and compassion to the needy, trusting God to give its staff strength as they serve together. With God’s grace, in the financial year which ended March 31, 2008, the MWS was able to assist 28,768 individuals through its five FSCs islandwide. These ndividuals include parents who attended centre-based talks and students in the school-based social work programmes. 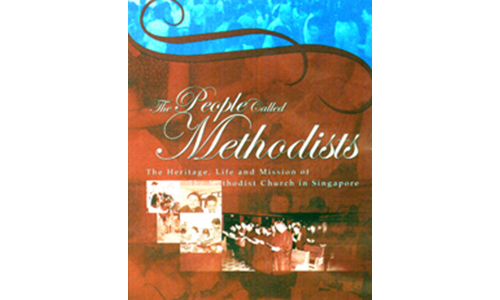 Most of the FSCs are run in partnership with Methodist churches. Established as one-stop family help centres in the heartlands, the FSCs have three core services: information and referral, casework and counselling, and preventive and developmental programmes. Among the 28,768 families and individuals who came to the MWS was Madam Sarah (not her real name), a mother of three girls. Madam Sarah juggled two part-time jobs to cope with monthly household expenses and could not pay the Student Care Centre fees for her 12-year-old twin daughters. Her husband was abusive, heavily in debt and did not contribute to the family income. Although her husband eventually walked out on the family, he kept in touch with their children and sowed discord between them and their mother. Her daughters also often quarrelled with each other and once, a neighbour even called in the police. A distraught Madam Sarah came to one of the FSCs for help, crying as she poured out her struggles. An MWS counsellor was able to provide emotional support, and helped her improve communication with her children. Through further counselling she learnt how to better manage her children, her stress and anxiety. She also took action to protect herself from further physical abuse from her husband. Although things are still far from perfect, she now feels more empowered to cope, manage her emotions and her family. difficulties with children and in-laws. 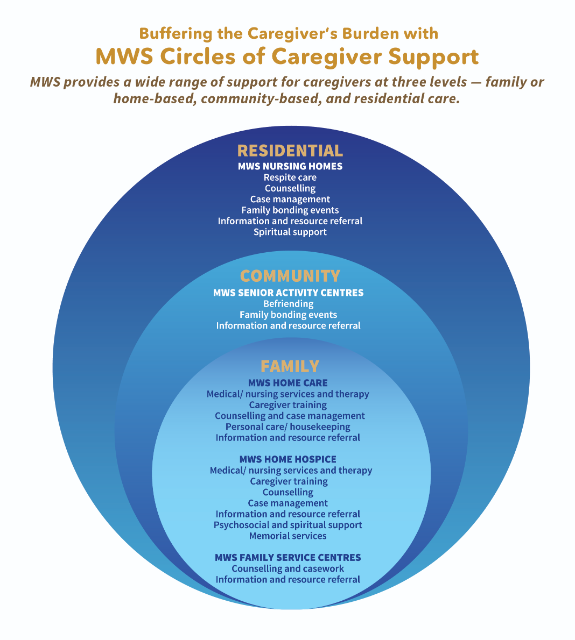 Depending on the complexity of the needs of families, MWS social workers and counsellors often work with families and individuals from six months to over a year. Social work is labour intensive as qualified professionals like social workers and counsellors spend time helping people in dire need. The MWS raises funds in order to continue its services to needy families, as well as children and youth at risk, the frail and the sick elderly, the destitute and the terminally ill.
Its fund-raising philosophy is based on “deficit fund-raising”, to raise only what it needs to cover operating expenses for the year. This is derived from the difference between the projected operating expenditure for its HQ, centres and outreach for the fi nancial year and the projected income from government funding, contributions from partner churches and programme fees. In the financial year ending March 31, 2009, the MWS’ projected operating expenditure is $19.1 million. Of this, it needs to raise $5.1 million through fundraising events such as its annual golf tournament, and donation appeal mailers. Should the MWS fail to raise this amount, it will tap its reserves, funds accumulated over the years when donations received were more than what was needed to run its programmes and services. At present its reserves stand at about $10 million. In the worst case scenario that it is unable to raise any income, this amount will last only six months. However, MWS staff believe that as they serve the poor and needy faithfully, and as they pray and trust in the Lord, their work will continue. Would you pray along with us? Mel Lee is the Assistant Manager (Communications) of the Methodist Welfare Services.